Italy's longest river runs from near Piemonte in the Cottian Alps in an Easterly direction for 650km's right across the top of Northern Italy before spilling into the Adriatic via the delta close to Venice. Catfish have thrived in the river for more than 25 years and have spread pretty much throughout the system and its tributaries. 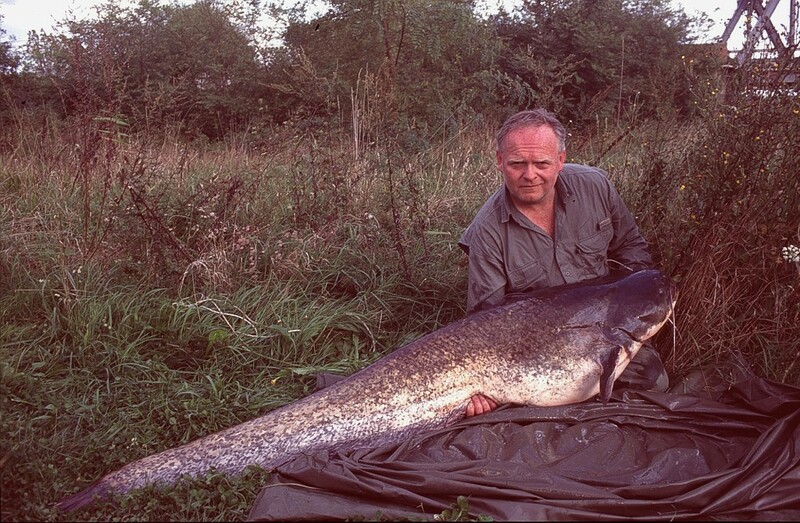 The first anglers to realise its huge potential were CCG members Kevin Maddocks and Keith Lambert who along with Italian based UK angler John Laing started pioneering the river in the early 90's. In those days the river was largely unfished for catfish and the fortunate Mr Laing had the river pretty much to himself and enjoyed fabulous catches. Inevitably,following the success of these anglers and the subsequent publicity created, more and more anglers (mostly German and Italian) started exploring the river fully. Today it has established itself as one of Europe's premier catfish venues, and despite suffering from a heavy amount of illegal netting and poaching, it is the number one venue in terms of truly huge cats! The River Po is a very difficult water to fish and is not for the feint hearted or beginner. Boat fishing is pretty much essential as there is so little bank access. The river is subjected to heavy commercial boat traffic mostly massive barges carrying coal, sand or gravel and the main boat channel can get pretty busy - even at night! The river carries snow water in the spring and drains large parts of Northern Italy so is extremely prone to flooding, couple that with fluctuating temperatures and it is clear to see that the river is a very difficult if not impossible prospect for many days of the year. A quick search through Google will find a few German run camps up and down the river if you are looking for guided trips. 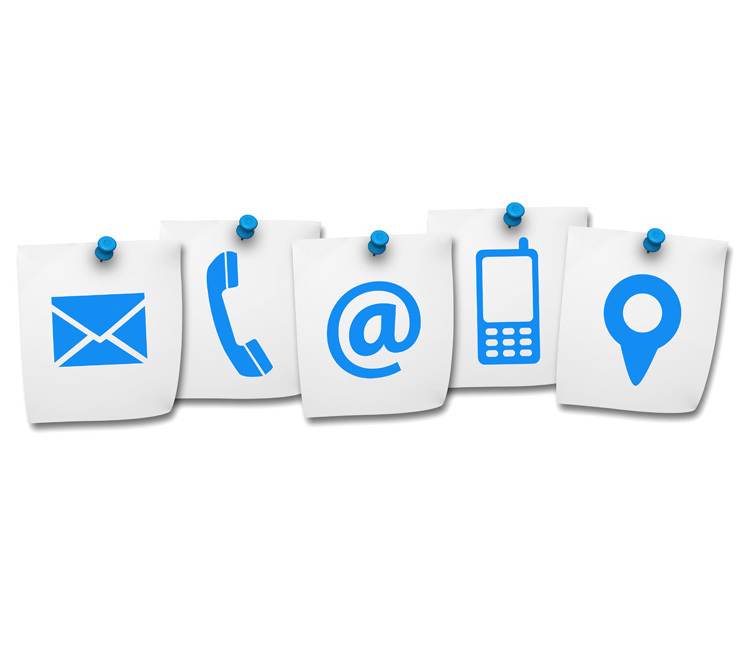 These will offer good facilities and experienced guides. For the more adventurous anglers the best way to tackle it is undoubtedly with your own boats and some keen mates. There is a huge amount of water to go at and cats can be caught anywhere, far better to explore these lighter fished areas than stick with the same water close to the heavily fished camps. 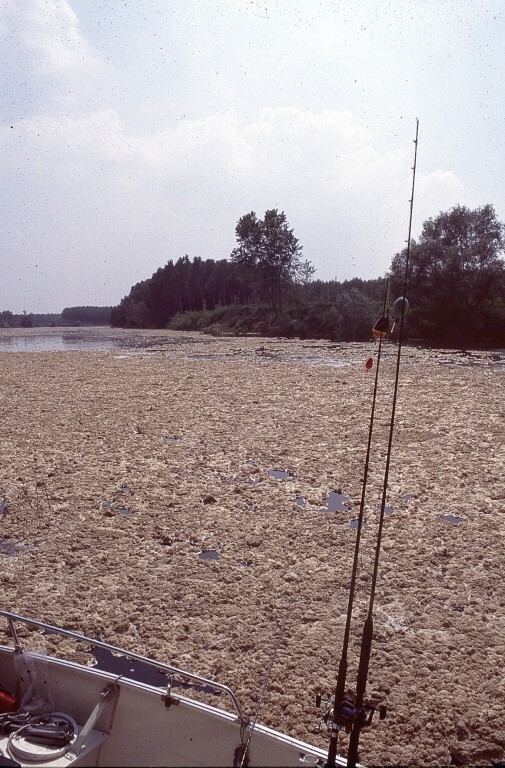 Summer floods churn up the sand and silt creating huge 'foam' rafts - difficult fishing conditions! So what areas to concentrate on ? The next area of note is Borgoforte where a hoist is used for getting boats in and out of the river. This area has been used as a base by many (largely German run) camps over the years and is a very heavily fished area attracting many anglers from all over Europe but it has produced some enormous fish, including many over 100Kgs! Continuing downstream, Past San Benedetto Po the river is joined by another catfish river the Mincio, again made famous by the CCG lads 20 years ago. The stretch of river below the confluence is beautiful and offers miles and miles of prime catting. Again, there is very little bank access and a boat is required to tackle the fishing properly. This part of the river features heavily in the Video/DVD A Catfish Tour of Europe- quite dated now but essential viewing for those anglers wishing to get a 'feel' for the river. The areas around Ostilglia with its thermoelectric power station down to Castelmassa and Sermide offer really interesting fishing with long sweeping bends flowing through stunning countryside. From here on down to the delta, you have the chance to catch huge catfish - they can be found everywhere! Other noted spots downstream of Ferrara are Polesella and Adria but everywhere is worth trying. 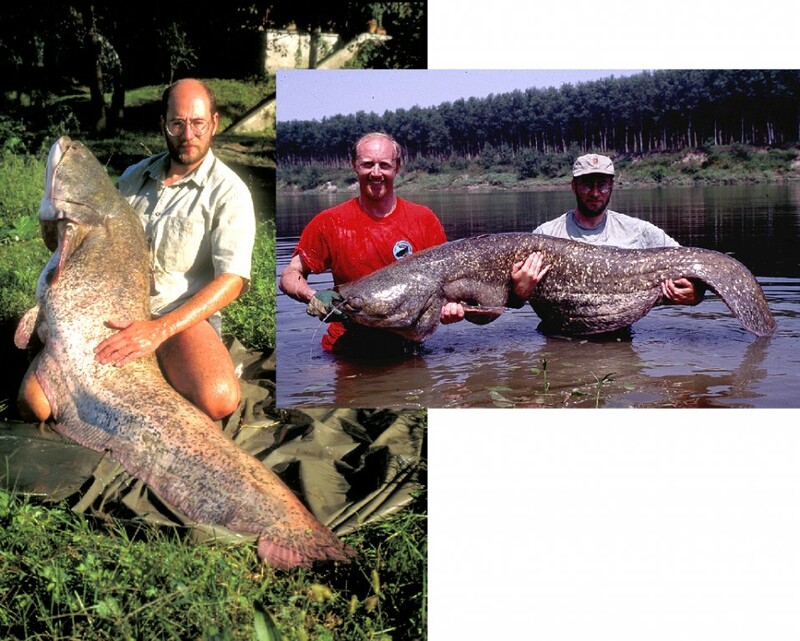 These fish were caught nearly 20 years ago- How big are they now ? The River Mincio leaves Lake Garda in the North of the country and meanders its way south to the ancient and beautiful city of Mantova. In the 12th Century, the river was dammed here to form three lakes : Lago Superiore, Lago di Mezzo and Lago Inferiore and it is here at Mantova that the river begins to interest anglers fishing for Siluro. The top lake - Superiore is heavily weeded, very clear and full of lilies It is a difficult prospect for catfishing - unless you have a boat and can pick your spots carefully. Floatfishing, jigging and free roving live baits are successful here. The middle lake (Mezzo and the lower lake (Inferiore) both hold good numbers of catfish. Mezzo is quieter with a strong flow where it enters from Inferiore, trotting livebaits can work well here. Both lakes are a haven for mosquitos and horseflies! The lower lake sees a lot of attention from carp anglers and although it is very close to the town and one bank runs alongside the main road, there are a few quieter spots amongst the reeds. The lakes lie within the boundaries of a nature reserve so expect regular visits from park rangers, wardens, fishing bailiffs, the police and just about anyone else with a big hat and a pistol! Oh, and due to its proximity to the town, you can get pizza and cold beverages delivered to your swims, the cold drinks being essential for those on a drive and survive trip as the area can regularly tops 40 degrees C in high summer! Further down river where it leaves the lakes behind there are some secluded spots and the river is quite small and even has a few bank spots although you may need a boat to get to them! All of this part of the river contains many catfish although they are generally smaller than those of the Po so the river sees less attention. There are however some huge fish present. An echo sounder is the key to fishing the Mincio as the depths vary hugely and some areas are scattered with massive boulders. Clonking was the most successful method 20 years ago when CCG members fished it but as the method is short lived, floatfishing livebaits or legering deadbaits is likely to be a winner. Don't even consider buoy fishing; the river has a heavy amount of boat traffic and every now and again huge tanker like barges manage to navigate the tight bends almost touching the banks fore and aft! 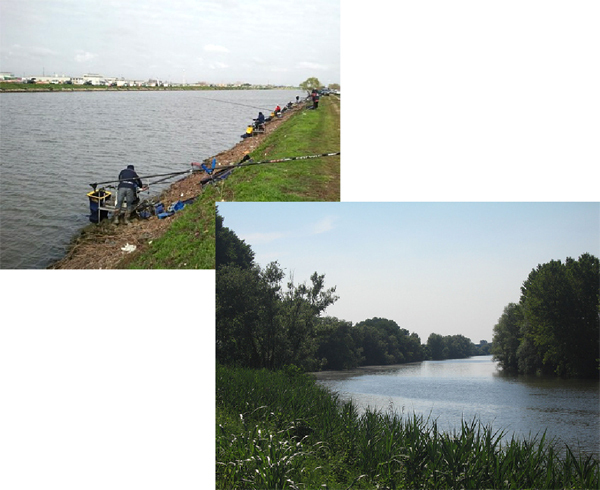 The lower Mincio can be a prolific piece of water as it meanders through beatiful scenery and countryside and anywhere is worth presenting a bait although deep holes and the long bends regularly present the best fishing. At the end of the river just before it joins the Po, there is a huge electric gate - like a monster lock that needs to be negotiated. There always used to be a gate keeper in charge but if he wasn't around, then it could be a long wait - many hours, days even, things happen slowly in this sleepy part of Italy! After flowing through the lakes at Mantova, the River Mincio exits the lower lake and one section splits off to form the start of the Canal Bianco. The canal runs roughly parallel to the Mincio until it joins the Po before continuing for approximately 150Km before eventually reaching the Adriatic near Venice. The canal roughly shadows the course of the Po and there are many connecting channels, canals, streams etc. Consequently, it is stuffed full of catfish! Boat traffic is generally light and consists mainly of pleasure craft and light commercial boats. The Canal Bianco is generally overlooked by catfish anglers, the majority of whom prefer to concentrate on the River Po but this could be a big mistake as the canal holds plenty of cats that are growing big on the huge shoals of bream and carp that are present - one reason why the venue is popular with Italian matchmen. Away from the more industrialised sections of canal, the water has some beautiful looking stretches with plenty of overhanging trees and catty looking swims. As ever, a boat is the best way to travel the canal and float fishing or legering at anchor is a good starting point although clonking has been effective in the past. There are very, very few slipways on the canal so a smaller boat that can be manhandled may be an advantage, as is a vehicle fitted with a winch for removing it after fishing! For adventurous anglers who prefer smaller rivers and seclusion (you probably won't see another fishing boat) the Canal is crying out to be explored. Visiting CCG members fished it for one afternoon in the mid-nineties with virtually no previous knowledge and managed to winkle out a 93 pounder! Other Italian rivers known to hold catfish but requiring further exploration are The Arno and its tributary The River Greve in Tuscany. 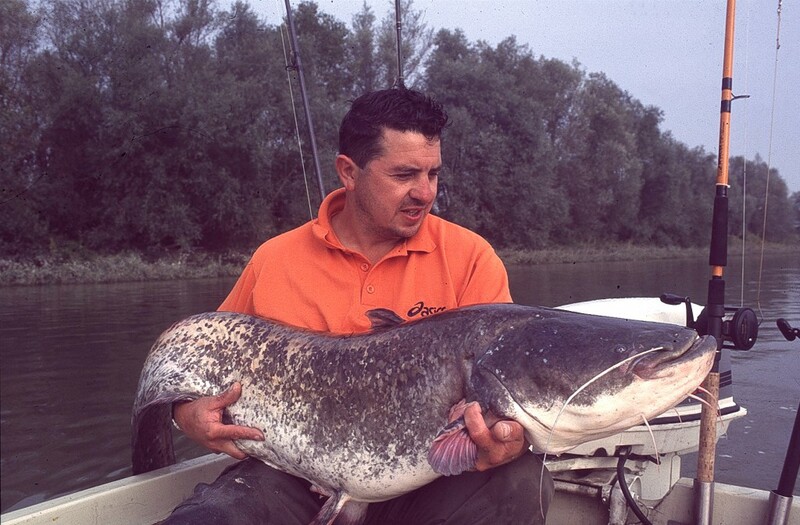 The Arno has produced big catfish for many years but its potential is still largely unknown. Further south in the region of Campania, The River Volturno is another yet to be 'discovered' catfish venue. A quick scan through Google will give a few clues to its potential but it has certainly produced fish of over 100lb.